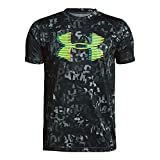 Interested in the Under Armour Boys' Tech Big Logo Printed T-Shirt, Graphite (042)/High-Vis Yellow, Youth X-Large? Is the price too high? You can easily price watch this product and we'll notify you when the price reaches your target.